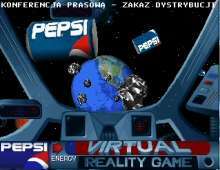 This is a below-average 3D action game from Pepsi, the world's cola giant. Aside from the dubious merit as the first 3D promotional game ever made, there is little to recommend this obscure title. This is basically a simplistic arcade-style game where you use the mouse to avoid steering your ship into wandering asteroids and other galactic obstacles. Along the way, you can pick up Pepsi to replenish energy. You can also try to shoot the obstacles, except it is hard to do given jerky and over-sensitive mouse movements. Another annoyance is the fact that you need to sit through the 15-second introduction scene every time you start the game. Since there is no way you can abort this, and the game isn't worth waiting for the intro to end, it's just another banal promotional title that won't change anyone's opinion about how bad promotional games usually are (before the late 1990s, anyway).